I’m sure you know by now, about my love of stripes. So when i saw this Zara blazer, it was an automatic purchase for me, because I knew I’d be able to wear it so many times, in so many different ways. Although you don’t see them often here, I wear jeans a lot in my every day life. They’re easy to throw on, whether with sneakers, boots or heels, and you can wear pretty much anything with them. For a simple look, wear your striped blazer with a plain tee, a pair of distressed denim and a cute pair of pumps. I added a floral pair…because #mixedprints, but any pair will do! More in line with what you see me in on a regular basis, I styled my vertically-striped Zara blazer with a diagonally-striped dress! I purchased these pieces at the same time, but didn’t think to wear them together until I took them both out of the box. I mean… they really couldn’t be a more perfect match! Keeping with adding more color to the look, I paired the blazer with a pair of red pants and a grey graphic tee. 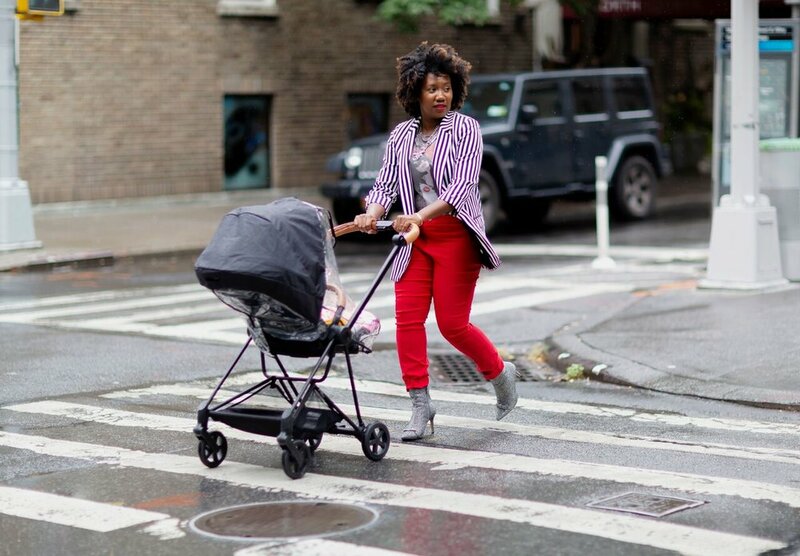 I threw on a bold statement necklace and a pair of rhinestone booties to complete my rocker-mom chic look. It's not often that you'll see me wearing a super matchy outfit. But when I found this blazer that perfectly matched the Walk Away Pants currently in my shop (only 1 pair left in a sz M! ), I had to buy it. I've had this blazer for a while, and surprisingly, have only worn it once before even though I'm completely obsessed with the stripes! For this look, a black black, fitted, v-neck tee was the simplest pairing, and to add a little color & interest to the look, I wore my orange pumps. How would you wear it? Would you wear both pieces together or separate them? Let me know in the comments! I've got this thing for kimonos. The brighter, the better. So when I found this one at Forever21 (now sold out, unfortunately), I had to have it! Because the color is so vibrant, I decided to pair it with a simple pair of jeans and white tee. I threw on some gold jewelry to add some interest, and voila! As you all know, I love wearing color and lots of prints, but I still always shop with multiple outfits in mind. How can I get the most out of this piece? How many different ways can I wear it? What do I have at home that I can wear this with? These things are always floating through my head when I’m shopping for myself or helping others pull together wardrobes. Fun fact: this is something I learned from my father (a man who I’d never seen shop for himself – but always told me to shop with my current closet in mind)! As an expecting mom who's in between maternity clothes and regular clothes, let me tell you - it has been a challenge figuring out what to wear on a daily basis! Not to mention, I'm trying to go as long as possible without having to buy anything maternity. Haha. My style philosophy is quite simple. Only buy/keep/wear things that you love and that bring you joy. That way, when you get dressed every day, you'll always be Dressed in Joy, and you'll always feel good! For this post, I’ll be featuring a sheer striped blouse as my 3 ways to wear item. Stripes are everywhere this season, and this is a classic silhouette that you can wear anywhere – to work, to run errands and in the evening. This particular one is about 3 years old, from Old Navy, and it’s a bit oversized, so it fits my pregnant belly (for now!). As a lover of prints, I always find a way to shake things up a bit and mix prints together. I know print mixing isn’t for everyone, so I’ve also included a couple other ways to wear this blouse, that are just as stylish. 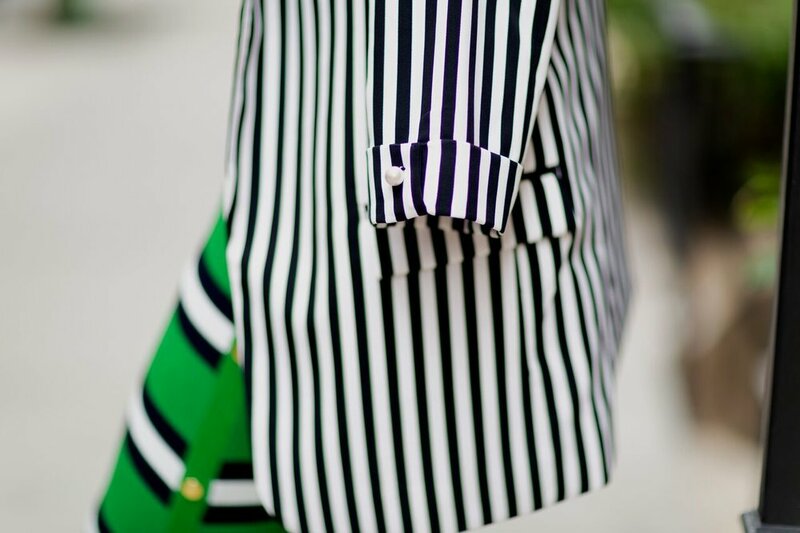 Any of these looks can be worn with any light-weight blouse you have, striped or not. I hope you enjoy! Seeing this look now you can understand why I emphasized wearing “light-weight” blouse. I love this look because it elevates your denim shorts just a bit, while still keeping the look casual. I threw on my favorite suede Pumas from Solange’s Word to the Woman collection a couple of years ago for a pop of color. Something I always say when it comes to mixing prints together, is treat stripes (& camo & leopard) as a neutral. 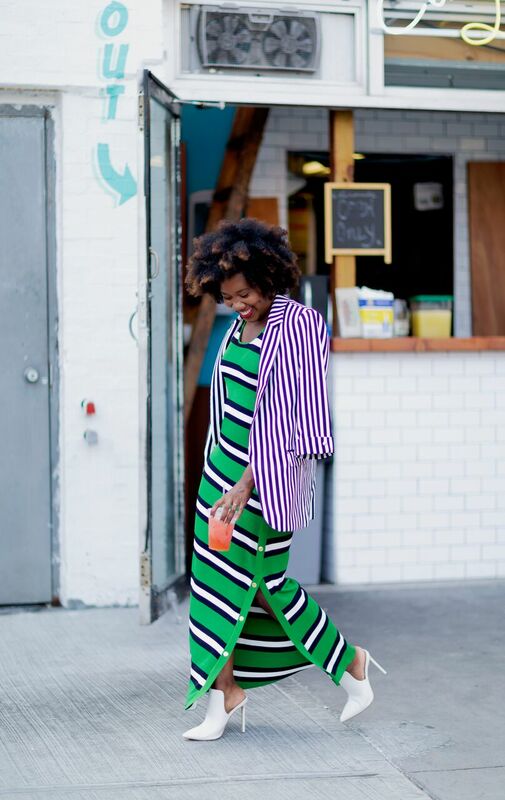 Pair stripes with pretty much ANYTHING, and it will work, I promise! Here, I’ve paired my striped blouse with a pair of floral printed pants from H&M. This works really well because the pants are black, which pulls from the black in the top. I’ve added a white solid layer that pulls the whole look together since white is in both pieces. I chose a simple shoe to keep the focus on the outfit! I hope this gives you a little glimpse into my personal style, and a few ideas on how to style your bump if you're expecting!